First Call Signs, part of the Stocksigns Group, is providing valuable advice about signage for the upcoming festival and events season. With the weather rapidly improving, it’s time for event organisers to begin thinking about how their occasions are going to look and what equipment they will need; this extends to signs. On average, festival attendance in the UK rose by 1.1million people between 2012 and 2016, and this huge rise in popularity increases the likelihood of slips, trips, falls, and trouble finding specific areas of the groups. The presence of signs help control the risks and keep visitors safe. 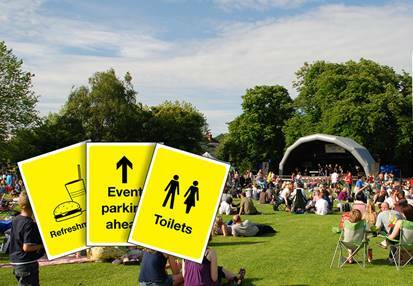 First Call Signs provides a wide variety of temporary signage, including information and safety signs for the event and festival industry. For the smooth running of any event, plans need to be put in place for creating signage and improving navigation; First Call Signs customises signs for all requirements.